WinAudioMLS offers plug-ins for special applications. These plug-ins are not part of the standard package, but we offer them as an upgrade. Since we offer many features for different areas, you might start first with your application to get an overview. We also offer bundles for different applications with significant discount. Measurement with amplifiers, soundcards, filters etc. The Vectorscope also known as a Goniometer is a powerful and widely used tool for monitoring stereo signals. WinAudioMLS sets the generator to the desired frequencies. Then WinAudioMLS waits a user definable time, stores the measurement results and steps to the next frequency. You can enter the start and stop frequency, the number of steps and the time for each step. The stop frequency can be smaller than the stop frequency to create a negative sweep. The following picture is an example of such an frequency sweep. The data can be imported by e.g. Excel for further analysis. WinAudioMLS can also display the sweep results graphically. This plug-in is similar to the frequency sweep plug-in. Here you can define a level range, the number of steps and the step time. This sweep is useful to measure e.g. the dependency of the THD from the level of non-linear devices. Please note that the level control works on the digital generator signal. If you use low levels, the noise and distortion are mostly caused by the generator itself. This plug-in is useful for doing long-term measurements or automatic (script based) measurements. At an user definable time WinAudioMLS writes all real-time measurements to a file. This file is purely text based, so it can be imported to any other program easily. In conjunction with the octave or 1/3 octave analyzer you can log the spectrum. This narrowband notch filter is dedicated for distortion analysis. 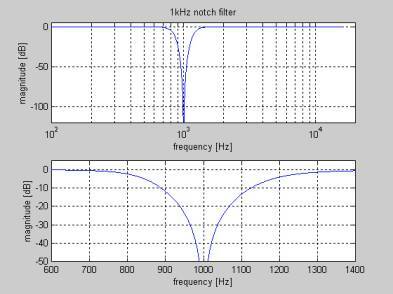 The basic 1kHz tone is removed. WinAudioMLS offers many option to measure noise within buildings. With WinAudioMLS you can measure the performance of attenuation elements or noise absorbers. The most important tool is the spectrum analyzer, which can be weighted with the 'A' or 'C' curve. With the dual channel functionality of the PRO EX version you can use different weighting factors for two microphones. Typical application is one microphone in the middle of the room and one in the corner. WinAudioMLS can be calibrated to measure absolute levels. For special applications we offer a module that is basically an octave analyzer according to DIN10052. The center frequencies are standardized 63,125,250,500,1000,2000,4000 and 8000Hz. Each band owns a peak memory. The average time is adjustable from fractions of seconds to hours. The data logger module allows long-term measurements within buildings. The following plot shows an octave log, drawn with Microsoft Excel. If you require a higher resolution we offer a 1/3 octave analyzer. Each bar contains its value in a numeric form to read the values fast and precisely. Together with the data logger module you can perform long-term measurements with the higher resolution. The most important parameter for room acoustics is the reverberation time. It is defines to the time, when the signal level is below -60dB after switching off. The reverberation time is measured with MLS / Chirp allowing significant better performance compared to impulse measurements.